Arriving at Rosslare in Ireland, it was already late and getting cold. With all the supplies we got from Lawrence and Marina, we had already feasted during the crossing and now only needed to find a place for the night which we found in a campground just five kilometers down the road. The first days were spent getting used to the country. The first stretch isn’t that interesting to be honest and after a couple of days we decided to hop on a bus to get to the west coast quicker. We got off at Skibbereen and made our way to Schull. We heard of a Film Festival going on there and spend two afternoons watching short films. A pleasant break from the cycling routine. I had to get some recordings done for the songs we did with Emilio and Gustavo back in Rosario. 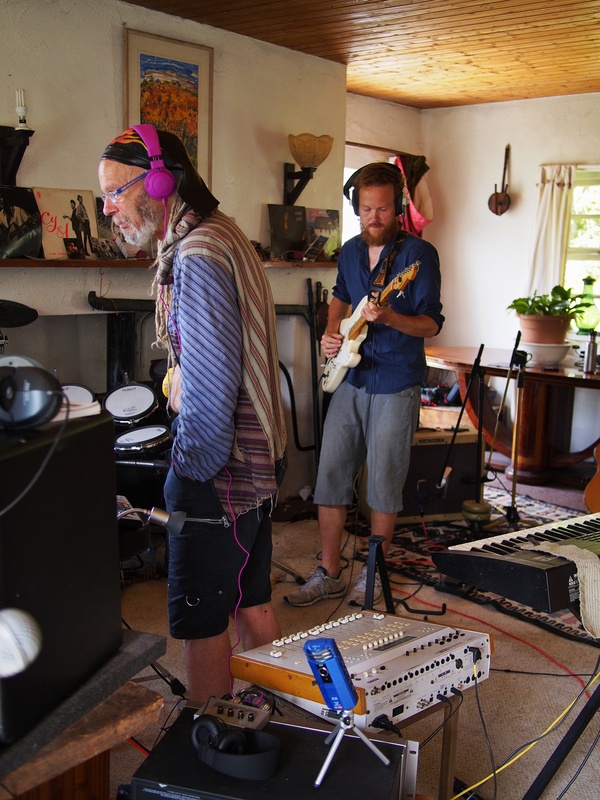 A quick internet research put me in contact with Paul, who ran the closest recording studio. Close to Glengarriff, we sat up camp in his beautiful garden and soon after got to work. It took a while longer and it was already evening until everything was done. Andrea made a quick dinner and then we were off towards the village for our first pub visit in Ireland. We walked along the main road and entered the only pub with music coming out if it. We ordered some Beamish and Murphy’s and took the only two remaining seats on the bar. In the pause after the song had finished, the man next to me suddenly started singing. At first being rather surprised, we quickly got into the atmosphere and were witness to some other rather bizarre musical interludes. At the end of the evening we sat down with the two musicians, Marie and John, and talked about music and our travels. Later they invited us to come by their house later that week and visit the highest pub in the country. 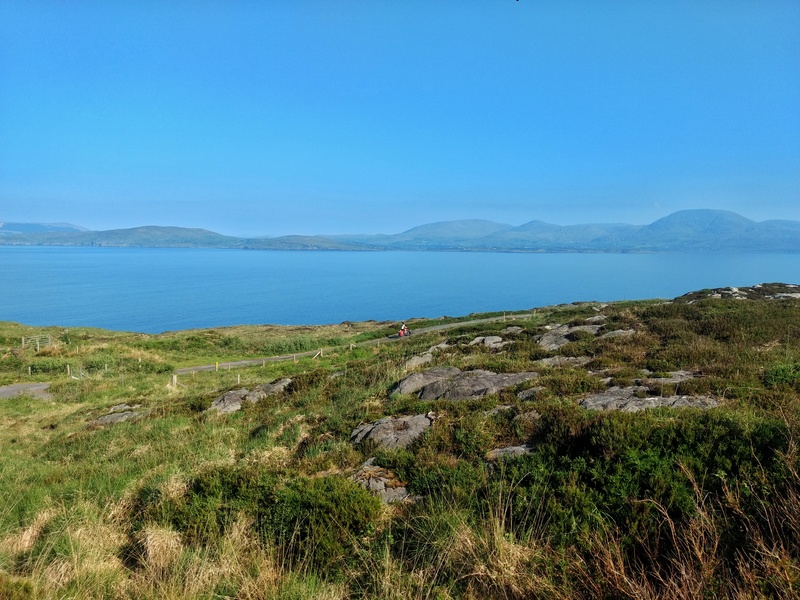 First though we cycled out the sheep’s head and parts of the Beara peninsula. In case you’re wondering why the sun is shining in most pictures, we are extremely lucky with the weather. There are a lot of views which you could just frame and hang on a wall. The rhododendrons were introduced in the second half of the eighteenth century when plants were brought to britain from all over the world. 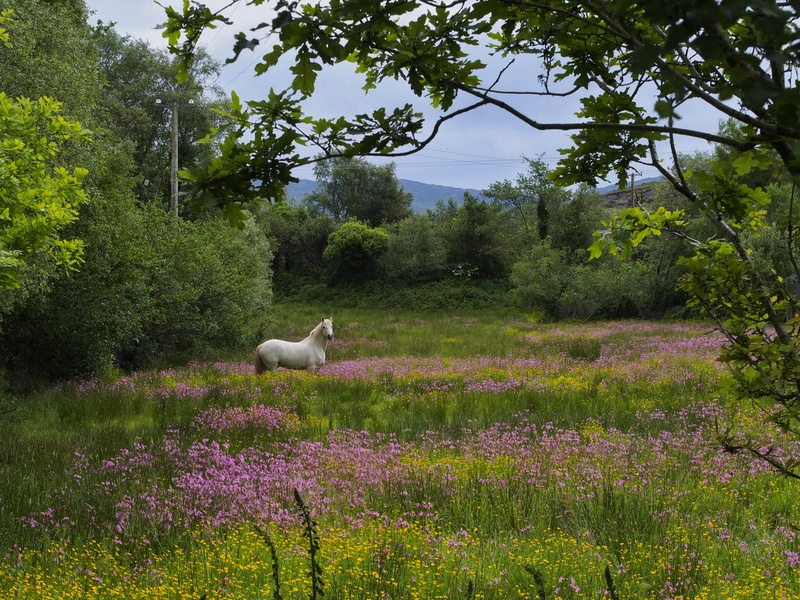 On Ireland they thrive so splendidly that they now face a serious threat to the native vegetation but look pretty beautiful while doing so. Cycling through Eyeries was a pleasure. It was a day of a wedding celebration at the local pub and the whole village was dressed in their finest. All the man in beautiful blue suits and as there was noone to be seen that didn’t belong to the party, it felt like cycling through a film set. 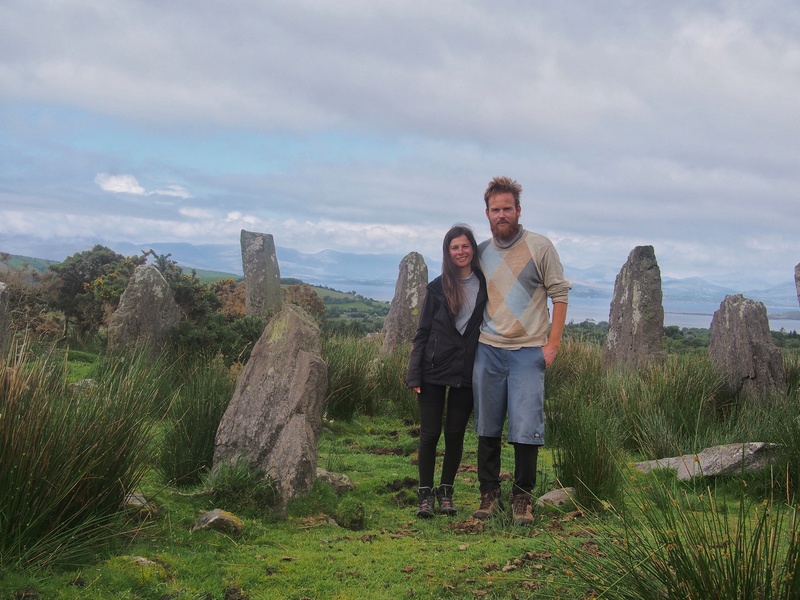 In the afternoon we stopped at the Ardgroom Stone circle. Later the scene was taken over by a herd of cows with their calfs. Usually we get interested look or blank stares when we cycle past but this time we felt it was time to take our leave as the looks were clearly stating that we were on their turf. We made our way to the house of Marie and John the next day and could stay in the cottage next to their house. 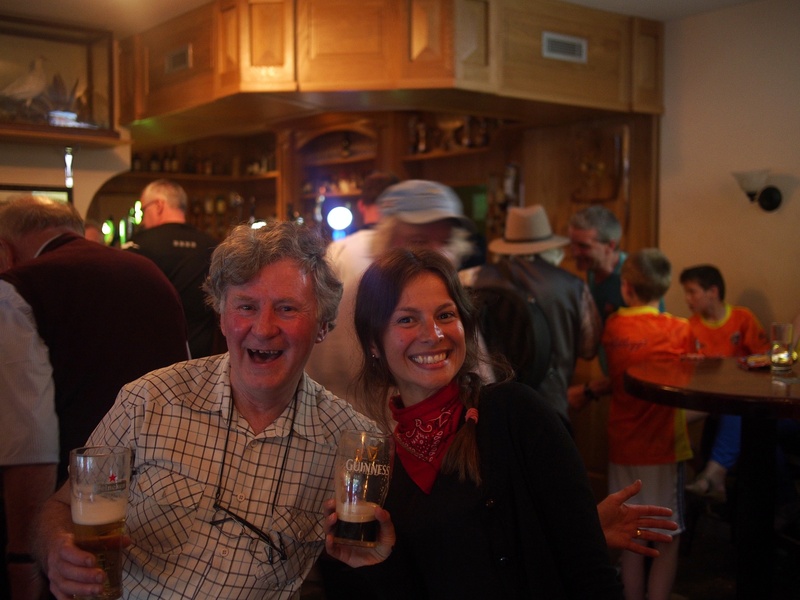 We had a typical Irish dish for dinner and went to bed early after five days continuously in the saddle. 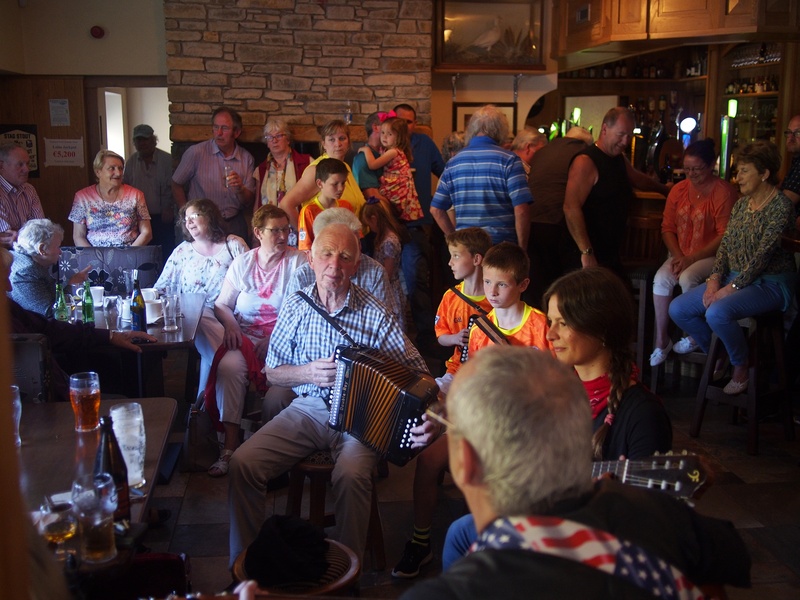 On the first Sunday of each month there is a music session in the Highest pub of Ireland, the “top of coom”. Half of the people gathered chipped in a song, a poem or a story and with the more famous songs the whole pub was singing along like “The wild rover”, “The leaving of Liverpool” or “Waltzing Matilda”. 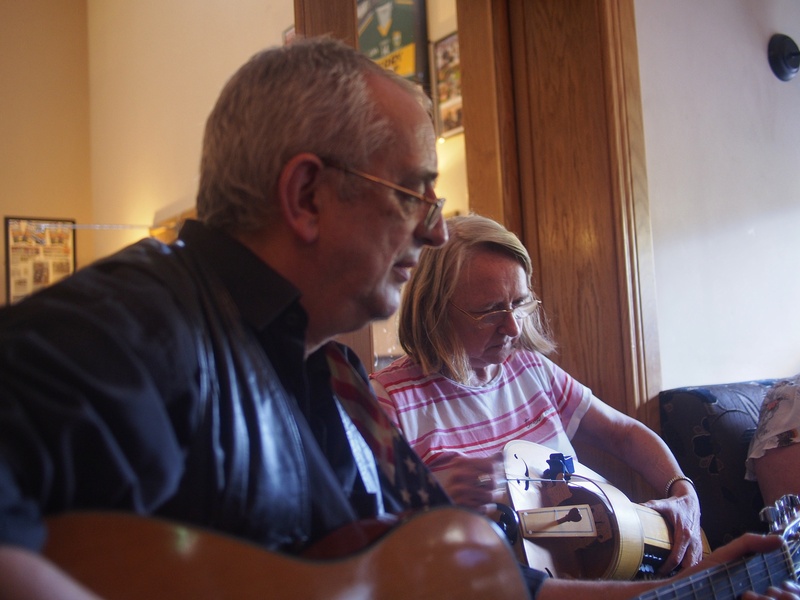 Our hosts Marie and John playing a song together. The instrument Marie is playing here is called a hurdy-gurdy. After the session we talked with some of the other contributors of the evening and shared a couple of Guinness. The next day we cycled to Killarney where we stayed in a hostel. 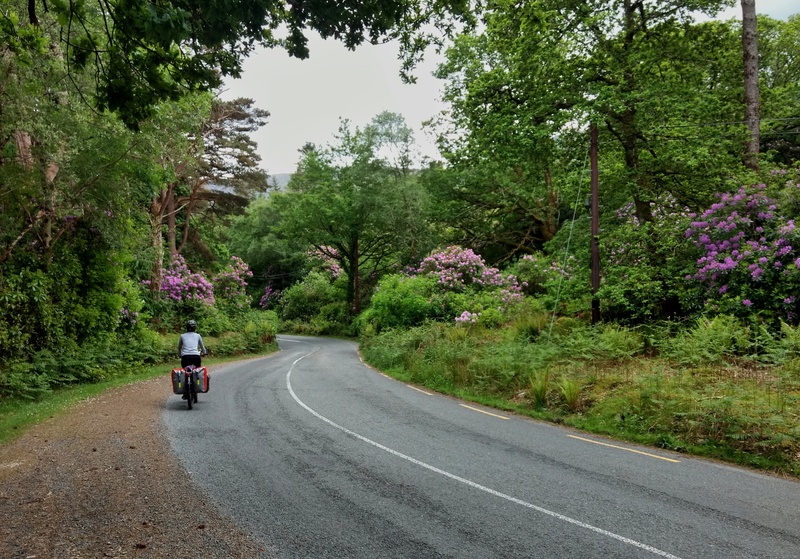 The Killarney national park has a lot to offer and we saw only a fraction of it. 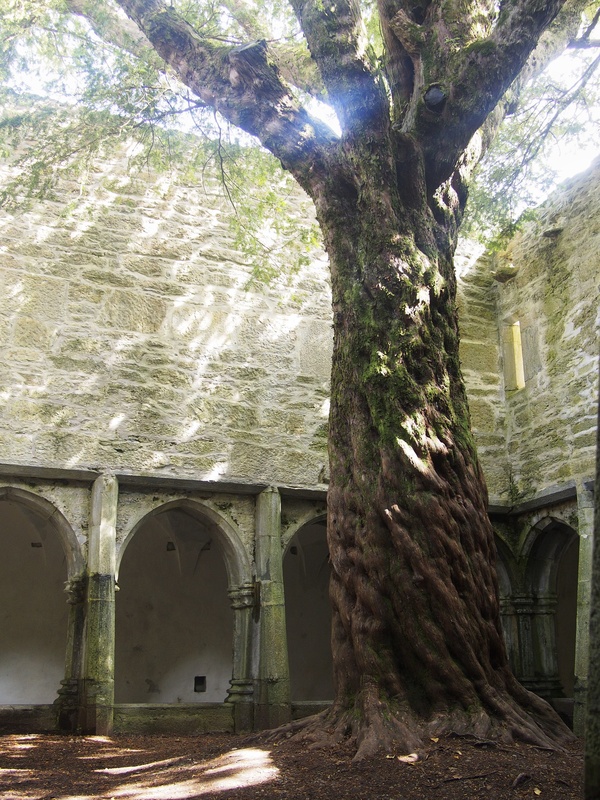 Muckross Abbey is a mysterious place and its ruin illuminated beautifully on a sunny day. 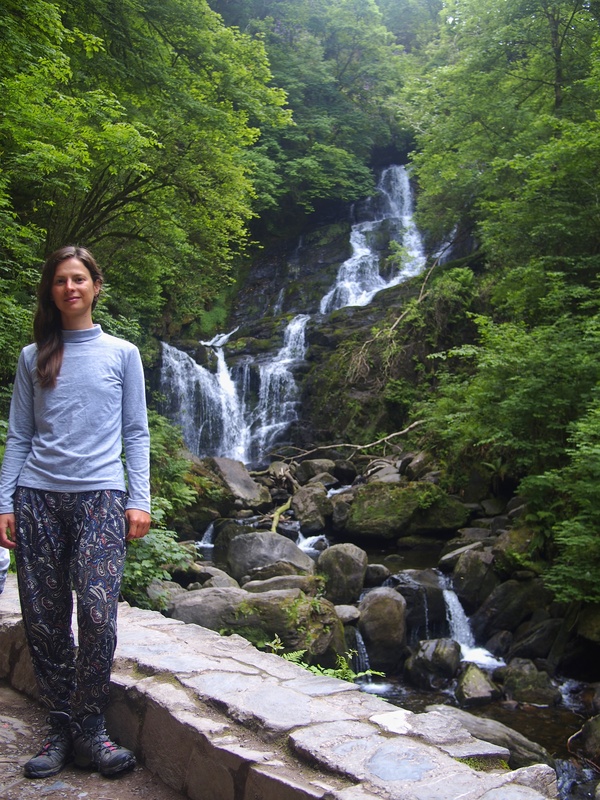 A small hike took us first to a small pool of water on top of the hill before descending to the Torc waterfall. 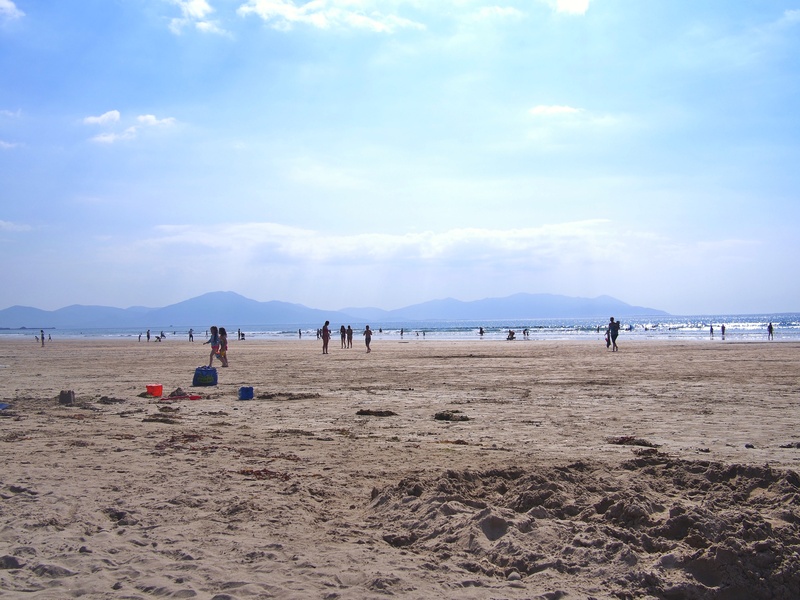 When we arrived at the campground near Banna, we half jokingly put on our swimming dress before hitting the beach. What a surprise it was to see a hundred people already in the water despite its rather cold temperatures. After being in the water up to our hips we weren’t sure for how long we could stand it. But after finally taking a complete dip in the waves, we felt quiet alright for another while. This was only the first half of our Ireland experience. We have crossed into county Clare by now and will have another three weeks to explore the northern half of Ireland.